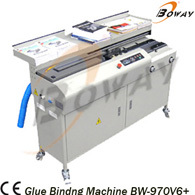 Automatically remove the unnecessary glue at the ends of book spine, ensure perfect binding machine. The speed of binding is can be set according to different operator and different demand. Increase the efficiency by 30%. Convenient worktable, you can place any needed material on it! Open cover platform make it more quickly to take the cover and lay back the book. Design of smoke evacuation make it more safety and environmental protection.